Faerie Blood was my first published novel, originally published through Drollerie Press. Drollerie unfortunately closed down late in 2011, but I resurrected the book via Kickstarter in Spring of 2012. Bone Walker, Faerie Blood‘s first sequel and Book 2 of the Free Court of Seattle series, was released in 2015 as part of the same Kickstarter. Meanwhile, I have the Rebels of Adalonia trilogy available through Carina Press. This includes Valor of the Healer, Vengeance of the Hunter, and Victory of the Hawk, in that order. Faerie Blood and Bone Walker are urban fantasy, and other works set in the same universe will generally be in the same genre. The Rebels of Adalonia trilogy is high fantasy, though with a more post-medieval feel to it than many high fantasy novels have historically had. Don’t think sword and sorcery; think muskets and magic. I’ve got other works in progress that will fall in urban fantasy, fantasy, and SF, respectively. But in general you can expect me to write things that have SF/F as the predominant element, but with a prominent love story as well. So I have a foot in SF/F and a foot in romance–i.e., what often gets called ‘SF/F with romantic elements’. You can’t quite call me full-on science fiction romance, on the grounds that what love stories I write are usually not so prominent to the plots that the stories can’t exist without them. I don’t place as much emphasis on the romance as an outright romance novel would. So “SF/F with romantic elements” fits me better. Tell me about those other works in progress? You can read up about them right over here. What authors would you compare yourself to? Faerie Blood and Bone Walker are available in ebook format for the Kindle, the Nook, the Kobo, iBooks, Google Play, and Smashwords. A complete list of places you can buy each of these books is available over on the Faerie Blood page and the Bone Walker page. “The Blood of the Land”, the short story of mine previously published in the Drollerie anthology Defiance, is also available for sale, 99 cents in most places, but also for “reader sets price” (including free) on Smashwords. A complete list of places to buy this story is on my Short Stories page. 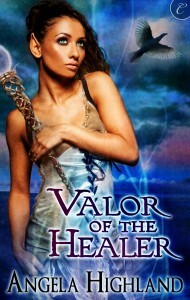 Valor of the Healer is available in digital and audio format. It’s available directly from Carina Press as well as all major ebook vendors, and the audiobook is available from Audible, Amazon, and iTunes. All the places you can buy this book are on its official page. 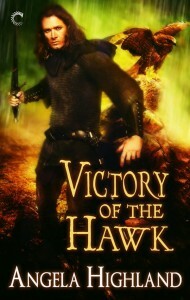 Vengeance of the Hunter and Victory of the Hawk are available only in digital format at this time. Like Valor, both of these books are available directly from Carina Press and all major ebook vendors. All pertinent buy links are on the Vengeance of the Hunter page and the Victory of the Hawk page. Ebooks are difficult for me to read/I prefer print books. Are any of your books in print? Yes! Faerie Blood and Bone Walker are both available in print format, and I print as many copies as I need at any given time. I periodically announce new print runs, and hand-sell the copies when I have them available. Both books can also be ordered in print via Bandcamp, as my wife and I sell them as associated merchandise for the Bone Walker Original Soundtrack released by Crime and the Forces of Evil. See the Faerie Blood page and the Bone Walker page for details. Are there print editions of your Carina books? Not right now. Carina is a digital-first imprint, and while a small number of Carina titles are available via Amazon in print format, those are Carina’s best-selling titles. If you’d like to see the Rebels of Adalonia trilogy in print, the best thing you can do is to buy the ebooks, either for yourself or for friends, and to tell others to do the same! Are there translated editions of your works? Not right now. Carina is in charge of dictating whether the Rebels of Adalonia books get translated into any market, and thus far, they have not elected to pursue that. If you’re interested in seeing any of those titles get translated, the best thing you can do is buy the books, for yourself or for others. Or tell others about them! Faerie Blood and Bone Walker and related works, since those are entirely under my control, could possibly be translated at some point. Faerie Blood does occasionally make sales on Amazon DE, and since I’m interested in both German and French, I’d be open to translating those works. However, it’d cost money since I’d want to pay for professional translations. If any readers out there would be interested in seeing this happen, let me know, and I’ll look into it further. Is your name really Angela Korra’ti? Here’s the thing: I was born “Angela Highland”. I still answer to “Angie” for the sake of my relatives and oldest friends. I also use “Angela” to sign my checks, and that’s usually what people call me at work. I get “Korra’ti” from my aforementioned partner. I took her last name as mine when we married, so that there would be two of us in the world. It’s pronounced “kor-uh-TEE”, accent on the third syllable, roll the R’s. Mostly, though, I answer to “Anna”. It’s easier to pronounce and easier to type. Cool, what nationality is “Korra’ti”? Slightly longer form: my partner doesn’t know who her parents were and therefore doesn’t know the origins of her name. Our best guesses so far have been “Finnish”, since we’ve found references to versions of the name in Finnish on Google; “Croatian”, from a linguist at the University of Kentucky; and “Hungarian”, from a pizza delivery guy. The latter of which might strike one as an odd source for linguistic information, but he said he was Hungarian and knew Korra’tis in Hungary, so. Some variety of the name does therefore seem to be out there. Angela Korra’ti is my actual real-life name. But truth be told, it’s a tough name to spell. Dara and I have had issues with this all our lives, and people who have known us for many years still have trouble remembering how to spell the name sometimes. When I got the offer from Carina for the Rebels of Adalonia trilogy, Carina’s senior editor, my agent, and I all agreed that it would be in my best interests to use a more user-friendly name. Angela Highland, as my original name, is easy for me to think of as ‘mine’. Plus, it’s a shout-out to my family. So why do you use both names on your work? It’s a handy way to differentiate between what work I sell commercially, and what I publish on my own. If it’s got Highland on the cover, it’s something I’ve sold to a publisher. If it’s got Korra’ti on it, it’s mine. Why are you Anna the Piper? While Angela is my first name, Anna is a nickname that comes from my middle name. Many people who know me in real life call me Anna, and I usually always go by that unless I’m being formal or if I’m in a day job context. The Piper part sometimes confuses people, because they expect me to be a bagpipe player. I’m not. I’m a flute and piccolo player (with a side helping of guitar, and a little bit of bouzouki and mandolin as well)! But my friend Kathryn dubbed me ‘Anna the Piper’, and I felt that had quite a bit more rhythm to it than ‘Anna the Flautist’, never mind ‘Anna the Piccolo Player’. And so my long-term online nickname was born. I use it a lot whenever I’m posting somewhere in a fandom context. And I often refer to myself as Anna in my own posts! Please feel free to call me Anna! But I’ll also happily answer to Angela, or Angie, or Ang–all of which are names I’ve been called by family members or coworkers. I’m relaxed and groovy about it, and as long as it’s clear you’re talking to me, please be relaxed and groovy about it too. So what’s all this about Quebecois trad in your posts? When I’m not writing, I’m spending a LOT of time on Quebecois traditional music, with which I’ve fallen madly and passionately in love. I attend a monthly session to play Quebec tunes, which I’ve been working on learning. Several of my favorite bands are in the Quebec trad genre, and I’ve had the pleasure of meeting several of the musicians as well. This has also inspired me to work on learning French so I can better understand the lyrics to Quebecois trad songs, and also just because there’s SF/F being written in Quebec that I want to read, as well. So if you follow my blog or follow me on the social networks, you’ll see me posting about this a lot. And every so often I may even post in French. What else do you post about? Books, very frequently. I have recently done a Trilingual Hobbit Reread, and I’ve started one for Trilingual Harry Potter as well. I also want to finish or at least update my series of posts about self-publishing and how I’ve gone about doing that, and about various ereader devices with which I am now familiar. Look for posts to come on these in the coming months. Anything else you want to know about me, feel free to ask!